Change the way you think, work, and create with the HP Zvr 23.6-inch Virtual Reality Display, the first commercial 3D display from HP that delivers a virtual-holographic 3D image so you can see every angle and curve in lifelike detail. Experience real-time, natural interaction with your 3D content as the Full HD stereoscopic display's full-motion parallax sensors track and respond to the movement of your lightweight, passive glasses. Rotate, manipulate, navigate, and zoom in and out of every detail of the holographic image with the stylus pen. Project your 3D models to a 2D big screen for easy team collaboration using your choice of third-party hardware. Easily drive your architectural, MCAD, education, and scientific content from an HP Z Workstation or HP Business Desktop with dual-link DVI or DisplayPort connectors. 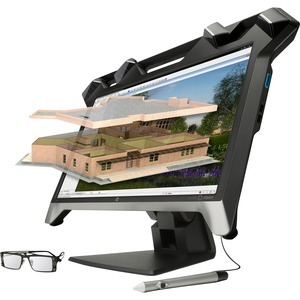 Import, view and interact with your architectural, MCAD, education, and scientific 3D content with the zSpace Studio Software. Create your own design, prototyping, and education-specific software with the included zSpace Developer Kit. Get world-class service and support from a three-year standard limited warranty. To extend your protection beyond the standard limited warranty, select optional HP Care Pack Services.